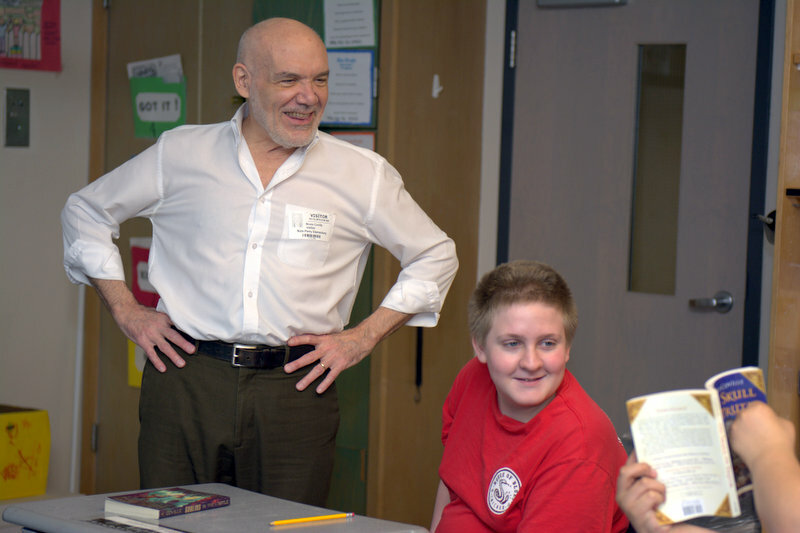 On Wednesday March 16, 2016, Miss Brown's classroom at NPE had the privilege and honor to have a special author visitor, Bruce Coville join our classroom to talk about writing. Our students have been reading his book Jeremy Thatcher, Dragon Hatcher during our daily read aloud time. Another student had been reading at the end of each day with the classroom Social Worker one of his many other books, Goblins in The Castle which has greatly sparked the student's interest in reading more. The classroom has also read his book, Monster's Ring in the past during a daily read a loud. In our room, we talk a lot about Growth Mindset and as part of that mindset we are inspired by other's success, we take on a challenge and we do not quit. 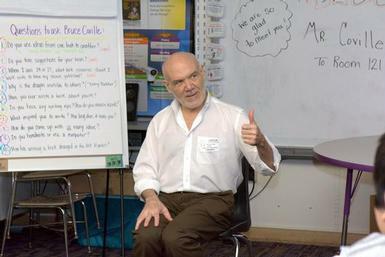 Writing can be a difficult process for many, but we began to be inspired by the writings of Bruce Coville and after all what makes more sense than having an expert come in and talk to us about the challenges of writing 100's children's book. He shared his recipes of writing a great story with our classroom and he shared his inspiration in a very animated and entertaining way. (He even stood up on a chair and told funny stories.) Students were able to ask the questions they have been thinking about over the past few weeks anxiously awaiting his arrival. Some of the students even shared some ideas they had for future books he would write and he encouraged them to write those stories. Prior to leaving, Mr. Coville autographed books with a personal message for each student. It was a great time meeting, listening and talking with Mr. Coville.